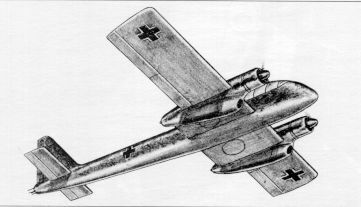 This Blohm und Voss project was designed as a general purpose/long-range fighter. The wing is straight and unswept, with the section between the two engine nacelles being thicker and having increased chord, to house the main wheels of the tricycle landing gear. Two BMW 801TJ (w/ turbo superchargers) were mounted at the forward end of the nacelles, and two He S 011 jet engines were located in the rear of the nacelles. There were two engine mounting designs, one had the entire jet engine mounted below the nacelle, in the other design the engine was buried in the nacelle with an air intake beneath. Several different turbojets were envisioned, the He S 011 (BV P.203.01), the Jumo 004 (BV P.203.02) or the BMW 003 (BV P.203.03). This aircraft was to be formidably armed, with two MG 131 13mm machine guns, two MG 151/15 15mm machine guns and two MK 103 30mm cannon, all firing forward and located in the fuselage sides. There was also a remotely controlled twin MG 131 13mm machine guns in the tail firing to the rear. 1000 kg (2200 lbs) of bombs could also be carried externally.